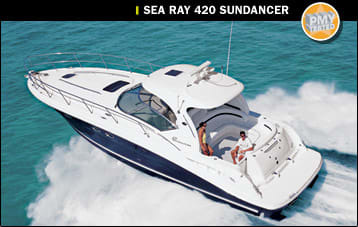 My brother-in-law Eric kept asking me, "Patrick, I like the Sea Ray 28-foot Sundancer. What do you think?" He&apos;d been looking at boats for about a year, and this was going to be his first. I knew he was already in love with the Sundancer. Knowing I work in the marine industry, he just wanted me to validate his decision. So what did I tell him? The answer was complicated. As my personal boat is a 31-foot sportfisherman and all she does is chase big fish in deep water, I&apos;m less concerned than he is with creature comforts. So while Eric was talking to me about air conditioning, galley appliances, and Corian, I was talking about hull construction and cockpit square footage. In the end, I told him, "It doesn&apos;t matter what I say. If you really like the boat, then you should get it." And he did. This spring he bought a 28 and invited my wife, Trish, and me along for the maiden voyage. Big mistake. Trish, who never knew life on the "other side" (i.e. a boat with creature comforts), immediately fell in love with the Sundancer&apos;s solid countertops, air conditioning, and well-equipped galley. So while my next boat will still be fishing oriented, I have a feeling my wife&apos;s Sea Ray experience will result in a demand for more amenities. Thanks a lot, bro. What Eric saw in his 28 is what to me sums up a Sea Ray: a well-laid-out vessel designed to let a cruising family kick back and relax when the workweek is done. I&apos;m just glad my wife and brother-in-law didn&apos;t see the 420 Sundancer I recently tested. If they had, I bet Eric would already be stepping up and Trish would want to quit the whole fishing thing. The 420, one of a line of Sea Ray midcabin cruisers that starts at 24 feet and concludes at 57 feet, has a profile as smooth as a porpoise. The builder calls her "racy," and she did seem a bit sexier than the 28, partly because there&apos;s more hull to work with, which carries her lines better. Her forward-angled radar arch adds to this impression and gives the boat a more European look. My test boat also featured a standard bimini top (a hardtop is optional). My wife, being fair-skinned, will most assuredly demand one of these on our next boat. I easily boarded the test boat, which was berthed at Norwalk, Connecticut&apos;s Surfside 3 Marina, via the standard integral swim platform. It felt sturdy underfoot, and as soon as I was aboard, I noted the comfortable-looking, starboard-side helm, which converts to a thigh-high bolster seat. I liked the setup, as standing is my favorite way to run an express boat. There was also a companion benchseat to port for your navigator. Just abaft the helm is U-shape seating that I&apos;d guess could accommodate as many as eight adults. (This is a far cry from the hold-onto-the-marlin-tower-leg philosophy that the Missus has become accustomed to on our boat). Don&apos;t sweat having space for enough PFDs, the stowage under the cockpit seating is more than adequate for this duty. Cockpit drinks and food can be better managed by choosing the optional ($167) cockpit U-line refrigerator my test boat had, instead of the standard ice maker. My one complaint in this area is that the step from the bridge deck to cockpit level measures nearly a foot; for people like me (5&apos;7" and long-leg-challenged) as well as older folks and small children, it&apos;s quite a stretch. Still, from outside, the 420 was looking like she had all the makings of a sweet cruiser for day trips or longer. The emphasis here is on longer. The below-decks accommodations feature an amidships guest stateroom with fold-down bunk and full head. There&apos;s also a master forward with full-size berth and a head with separate shower. However, as comfy as she was, I wanted to know if this boat had any get-up-and-go. Surfside 3&apos;s Capt. Andrew Maciel piloted the 420 out of the marina, and we worked our way toward Long Island Sound. 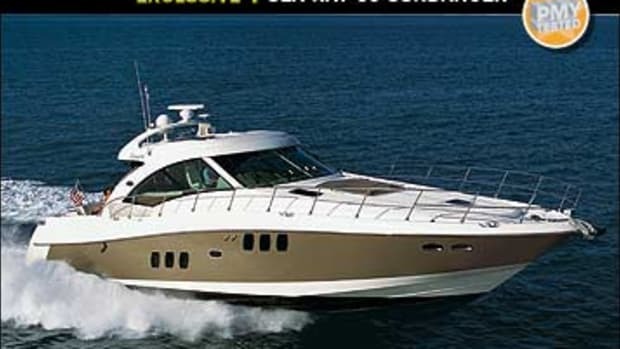 Once out on the slick-calm waterway, I readied my radar gun as Maciel pushed the Teleflex throttles to wide open and the 420 topped out at 35 mph (30.4 knots) while the optional ($73,000) 450-hp Cummins 6CTA diesel V-drives turned 2700 rpm, 100 rpm over their rated speed. Maciel handed me the wheel and I found the 420&apos;s Teleflex controls and hydraulic steering allowed me to move the boat as I wished with relative ease at all speeds. A bow thruster is optional, but I don&apos;t think it&apos;s a necessity. Low-end diesel torque in concert with 1.56:1 reduction ratio makes close-quarter handling a breeze. However, if you get the standard 370-hp 8.1 S Horizon MerCruiser gasoline inboards, you might want to consider the bow thruster. No matter how you power your 420, engine room space will be plentiful. Access is a snap. Press a switch at the helm, and the entire cockpit sole rises on a single ram. 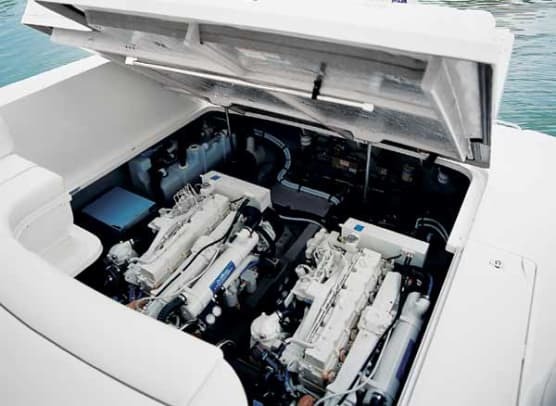 Once open, the engine compartment offered me enough room to walk around both powerplants, and I could easily access all maintenance points, both inboard and outboard. It&apos;s a well-laid-out arrangement that does not require you to have the contortionist skill of a Yogi to do maintenance. But I wondered, what happens if that hatch lift goes south? I learned from Maciel that the cockpit can be lifted manually by releasing pins under the cockpit sole. How do you access them if the sole won&apos;t come up? His answer: via a second hatch to port of the main one. But I digress. 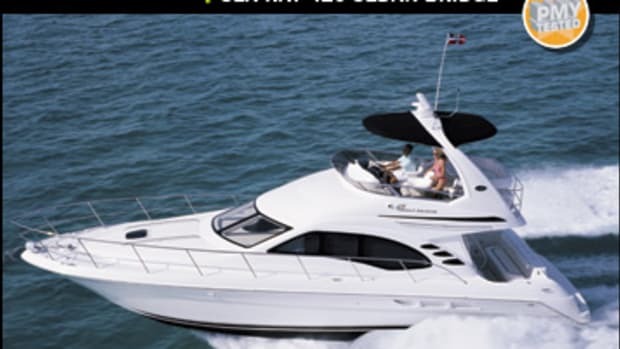 The most impressive part of being at the 420&apos;s helm—aside from an attractive curved dash with plenty of space for the optional Raymarine electronics package, complete with integrated radar and plotter—was simply the ride. I&apos;ve been on a lot of express cruisers that rode bow high—I&apos;m talking trim angles of seven, eight, and nine-plus degrees—obstructing the view forward. Not the case on the Sundancer. While I ran the 420 without tabs, her trim angle never rose above four degrees, allowing clear sightlines at all times. Kudos to the engineers who designed this modified-V (19-degree deadrise at the transom) hull. Having been on and run several Sea Rays, I found the 420 Sundancer the most impressive in the line so far, based on both appearance and performance. From the solidity of her fiberglass hull and fiberglass stringer system to the wide-open comfy layout of the cockpit, bridge deck, and engine compartment, she seems like an inviting place to spend the day, weekend, or longer. Perhaps even for a down-and-dirty fisherman like myself. Now where&apos;s my fishbox?